U.S. Senator Angus King (I-Maine) today [Nov. 3] visited with supporters at Dean’s Motor Lodge in Portage to discuss the important issues facing rural Maine communities. Dean’s Motor Lodge sits on the edge of Portage Lake and serves as a place to stop on scenic Route 11. EDITOR’S NOTE: Since our staff cannot cover all campaign events, we have created this site to share political press releases and statements with our readers. The items are posted as is and unedited. The views expressed do not necessarily reflect the views of Northeast Publishing. PORTAGE, Maine — U.S. 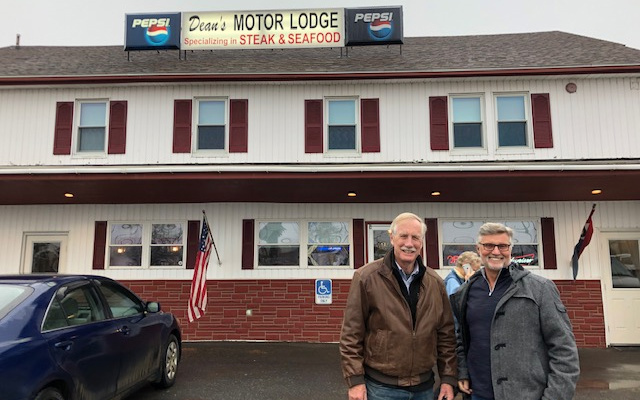 Senator Angus King (I-Maine) today [Nov. 3] visited with supporters at Dean’s Motor Lodge in Portage to discuss the important issues facing rural Maine communities. Dean’s Motor Lodge sits on the edge of Portage Lake and serves as a place to stop on scenic Route 11. Senator King’s stop in Portage is a part of his greater tour around the state to connect with the people of Maine in the final days before the election. During his first term in the Senate, Senator King has participated in more than 1,200 meetings across the state of Maine to hear directly from Maine people on the challenges they face, including issues related to healthcare access, the opioid epidemic, environmental concerns, and more. He has also hosted thousands of Maine people in his office, and holds a weekly “Capitol Coffee” every week the Senate is in session, where any Maine person visiting Washington, D.C. is invited to enjoy coffee and homemade blueberry bread and visit with Senator King and his staff.